It has been a matter of speculations for longer than a year. Now it’s here. On July 2nd 2018, the ban on trading all binary and digital options – mentioned in our recent communication (here) – came into effect. However, it’s not a complete ban as you might think. It only applies to non-professional traders and to the brokers residing within the EU (EEA). Professional traders may continue trading binary and digital options with brokers registered even in the EU. The only problem is that each trader aspiring for the status of a professional trader must meet at least 2 out of 3 defined criteria. What are the criteria? Trading volume: Last year (each quarter) the minimum of 10 trades with CFD or binary options worth the minimum of 150 euros, which is about 170 dollars. Trading capital: The minimum trading capital on your trading account has to be half a million EUR. Experience/background: Practical experience in the financial section of at least 1 (one) year. As you can see, the criteria are set to separate professionals from non-professionals. The first criterion is not difficult to meet. If you have been involved in the trading of binary options or CFD for longer than a year you can tick the first criterion as “done”. Yet, there is one more criterion to be met. I don’t assume that you have more than 500 000 euros on your trading account. So, you have to fulfill the last item; work in the financial section. This criterion seems to be pretty difficult and I guess that the majority of traders will not be able to meet it. One can estimate that the number of professional traders of binary options with IQ Option will be minimal. If you meet any two out of three criteria and are able to prove it: don’t hesitate to fill out the “re-categorization form” to have your status converted into professional. The form is displayed on the right-hand side. Each of your YES answers must be supported by documents demonstrating the relevance of your information. Unfortunately, this seems to be the end of binary options for EU based and regulated brokers. We all thought that trading of digital options would survive (…which was claimed by the brokers) but sadly, digital options fall among the banned instruments, too. It’s obvious that from now on, binary options are no longer available for trading, at least for the vast majority of us residing in the EU. However, IQ Option is not closing its business. It continues to offer forex, shares, and cryptos in the form of CFD. If you have your account there, you don’t have to be afraid. You can carry on trading, except for binary options. If you can’t stomach this change, there’s nothing stopping you from transferring your money from your IQ Option account back to your bank account. Attention! 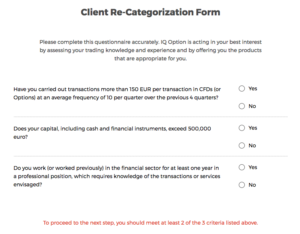 IQ Option has announced that they are working on a new product called FX Options (which does not fall under the ESMA definition) to be launched soon. Right now, the details of the product are not absolutely clear but I expect a kind of mixture of digital options and CFD trading including fixed stop-loss or take-profit. Do you live in the EU? Do you enjoy trading binary options? I sympathize with you. I know that many of you came to like this type of trading. But binary options is not the only type of trading. This means that you can continue trading online with other instruments such as CFD, cryptocurrencies, shares etc. Yes, you are right – these types are somewhat different, but the difference is not as big. It is still about one thing – investing money. 1) Register to a trading platform and transfer your money to your trading account. 2) Your analysis indicates that the price of bitcoin should go up. a) The price goes UP for you to cash $190. You earn $90. b) The price does not change a bit. You get your $100 back. c) The price goes DOWN. You lose your $100. 4) You knew your potential profit or loss prior to making a trade. Now, you can either continue with a next trade or withdraw your earned money from your account. a) The price goes UP. Each dollar by which the price goes up generates a profit of one US dollar until you decide to exit and close the session. b) The price hardly changes and keeps oscillating around the same price level. You neither gain, nor lose any money until the price moves. c) The price goes DOWN. Each dollar by which the price of BTC goes down generates a loss of one US dollar. 4) Your total profit or loss is known after completing the trade. Then, you can decide whether to continue with a next trade or transfer the balance from your trading account to your bank account. The trading of CFD and other instruments is somewhat more difficult than binary options. But the essence is the same: buy when prices are growing and sell when declining, ideally before the move takes place. For more details, read here: Why to trade Forex (CFD) instead of binary options. CFD, often mistaken for FOREX can be traded with brokers adapted for this type of trading. Is CFD legal? What about ESMA? Naturally, trading of Forex, cryptocurrencies and other assets using CFD is legal. In fact, this type of trading has been existing since the 1990s. Unlike binary options, launched around 2013, the history of CFD is tens of years long. What are the reactions from ESMA? Is there a danger of banning CFD trading? Nobody is able to predict the future. Not long ago, binary options were seen as untouchable. ESMA restricts CFD trading, too. But only to a certain extent (read more in this article). When is the change coming into effect? The ban on binary options trading came into effect on 2 July 2018. ESMA was given three month to decide whether to prolong the ban or return things back to the state prior to the imposition of the ban. Restrictions on CFD trading (smaller than in binary options) become effective a few months later. Does this ban mean an ultimate ban on binary options trading? 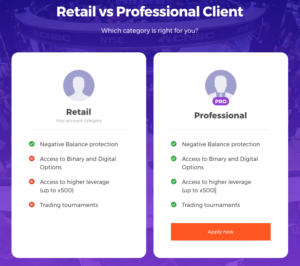 No, it doesn’t You can still trade binary options as a professional trader (the definition of professional can be found in the first section of this article) or with brokers outside the EU not regulated by ESMA. One of such brokers is an Australia-based HighLow. Is my money in jeopardy? No, it’s not. If it was it would be the right opposite to what the regulators wanted to achieve. Your money is yours and nobody is going to take it from you. If you have your money on accounts controlled by brokers such IQ Option or HighLow don’t worry. Instead of binary options, you can continue trading other instruments such as CFD or, you can withdraw your money to your bank account. I’d like to continue trading. What steps shall I take? To trade CFD with regulated brokers registered within the EU – further info can be found here: Why to trade Forex (CFD) instead of binary options. Soon, you will receive from us a new portion of information, news, guides, and reviews. Best of luck on behalf of our team!. Binary a digital options are promoted and offered solely to professional traders. We are sorry but unless you are a professional trader you are forbidden to trade binary and digital options. More information. You can trade Forex and cryptocurrencies. The most dangerous of ESMA regulation is too pessimistic paranoid interpretation of brokers. For example IG, IQ options, CMCmarket (UK branch), actually does not support demo account – because it is “propagation” in interpretation. Broker StockPair locked website for public. It is very bad interpretation – ESMA never prohibit demo account on binary optoins. Brokers do not have to interpret “proffesional trader” rigorously. Interpretation of brokers is possible very very free. ESMA make dissemination of alarm messages. It is is crime act. Director of ESMA Steven Maijoor can go to prison. On ESMA website I see informations which are false and legally invalid. It is false invalid regulation. ESMA extend disinformations. ESMA in EU countries law doesn’t have competence prohibit binary options and make limitations on CFDs. Help me please! We can take criminal complaint on Holland judicature on director of ESMA Steven Maijoor as physical person. Steven Maijoor can go to prison with high probability. For ESMA is no possible prohibit propagation of CFD or binary options, or prohibit demo account!!! Read you please article 40 from EU regulation / rule.